My mom has always been against eating hot food in the summer. She avoids making casseroles or soup while the temperature is above 90. But me? I have no bias. So Thursday night, I made one of my favorite meals, and in the pictures at the end of this post, you can even see the steam rising from my finished entrée. 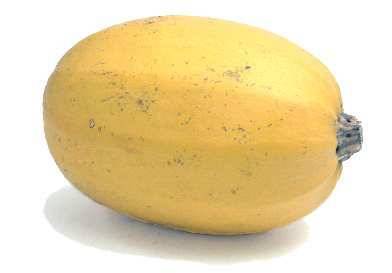 A couple of years ago, when I first learned of spaghetti squash, my whole world changed. If you’ve never had it, try it–and be prepared for your taste buds to do back flips. Plus, you can bake it, broil it, microwave it or cook it in a crockpot. When you’re in the grocery store, look in the produce department for something big and yellow. When it’s on sale, you can find it for $0.99 to $1.99 a pound. And if you’re lucky enough to find it for less than a dollar a pound, you can stock your pantry with them, because they keep for roughly a month if stored at room temperature. 2. Then, cut your squash in half lengthwise, being very careful to avoid slicing your fingers, which James has done before. 3. Spread 1 tbsp of olive oil on baking sheet/pan, and place halves face down. This ensures the squash doesn’t stick to the pan. 4. Pop in preheated oven and cook for roughly 45 minutes. 5. Meanwhile, dice your onion and mince your garlic. Then sauté in 2 tbsp of olive oil for roughly 4 minutes, or until onion becomes clear. 6. Around 4 minutes, add in two handfuls of spinach to sauté along with onion and garlic, and sauté two more minutes. 7. Add in diced tomatoes, tomato sauce, mushrooms, pepper, salt and seasoning. 8. Let simmer while you brown your beef. 9. Drain beef, add to marinara mixture, and continue to simmer until squash is cooked. 10. After 45 minutes, remove squash from oven, flip face up on pan, and allow to cool for 3 to 5 minutes. 11. Using a spoon, scoop out middle seeds and pulp from squash. 12. Then, peel back squash strings from sides with a fork. 13. Place stringed squash in bowl, cover with marinara and enjoy. Garnish with parmesan. Note: You may choose to sauté your mushrooms at the beginning along with your onion. Also, you’ll need a pretty big sauté pan for this recipe, as I’m used to feeding a small army of one–my husband.